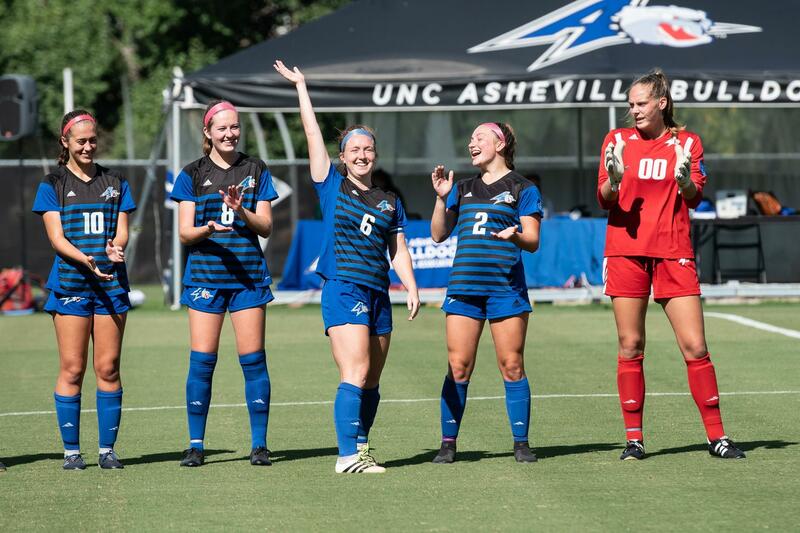 The UNC Asheville women’s soccer team wrapped up the 2018-2019 season with a 3-9-4 record. While it may not be the record the Bulldogs were hoping for this season, coach Lindsay Vera remains excited to continue work with the team. “I’m just excited to do it all over again now that I have one season under me,” Vera said. This was Vera’s first season with the Bulldogs coming off of her assistant coaching job at the University of Texas Rio Grande Valley. She came accompanied with a new coaching staff as well as many new young players. “We are a really young team,” said Ellie Stone, senior defender for the Bulldogs. The first season with a new head coach can be difficult, players often don’t know what to expect of a new coach. Kyra Kandle, another senior defender on the team, said she was happy that Vera turned out to be the coach. “Going into our senior year not knowing what we’re gonna get with a new coach I think we couldn’t have asked for anything better,” Kandle said. Vera brings a new outlook on the game to the team, as well as changing certain defensive and offensive schemes according to Emily Dueñas, a sophomore midfielder. “Lindsay came in and brought this new style which was the total opposite of how we were playing before,” Dueñas said. Bella Iorio, a senior midfielder for the Bulldogs, says this new style of soccer has brought a new found excitement to the team. The Bulldogs seemed to be a perfect fit for Vera as she expressed how much the team impressed her over the course of the fall season. With one season in the books, Vera’s sights are set on the upcoming spring season as well as next fall season. “We’re in a good position to build off of this going into the spring and for next fall as well,” Vera said. The Bulldogs have work to do. With a conference record of 2-6-2 the Bulldogs have got to find ways to get wins. Iorio has a simple fix for the team to increase wins. “We need to find the ball in the back of the net a little more than we did this year,” Iorio said. The Bulldogs averaged 0.62 points a game while their opponents averaged 1.44 points a game against them. UNCA simply didn’t take enough shots, averaging eight a game compared to their opponents 19. Where the offense struggled, the defense shined according to Stone. The Big South Conference title could be Asheville’s in the future says Vera. “I think this conference is a good conference but it’s definitely something that we can climb throughout,” Vera said. With a young team and a head coach coming off her first season, the UNCA women’s soccer team has their sights set on next season. “This team has a bright future,” Kandel said.